I was sad to see what the horse had done to the owners mother as she had to have several stiches because of the attack. I can understand why people might think this if they only have one horse or they have not been around horses long. I have 10 horses that run together everyday and I see them go after each other all the time. 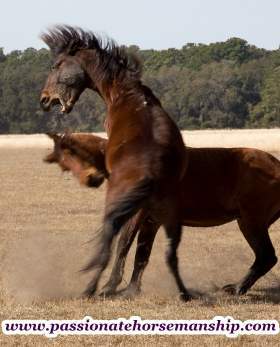 This is part of a horses natural behavior. Horses are always testing their place in the herd and if they can dominate the one above them they will so they can move up. It is survival with them. When out in the wild it is the strong that survive. In the herd there is always a leader. The leader is the one that keeps the herd safe. When danger is near the leader will give the herd a signal for them to run. Each horse learns as a foal about respect and authority. There is a pecking order within the herd and they learn this quickly. This is why it is so important for the owner to step up and be the leader for the horse. If you are not willing to step up and become the leader the horse will take charge. This is hard wired into them so they can survive. Horse need to know that you can move their feet. If they continually move your feet they are proving they are the leader. I’ve been around people that were afraid to step up into the leader role for fear of their horse not liking them. I’m here to tell you if you don’t step up your horse will not respect you. They are looking for a leader that will keep them safe. If you ever have the opportunity to watch horses in a herd you will learn a lot. When I watch my horses I see them doing such things as pinning their ears, shaking their head, threatening to kick, biting, pushing another horse with their shoulders and chasing each other. Most of the time I see horses trying to dominate people by pushing into them with their shoulder but they can be capable of doing the other things I listed. Stepping up to be a leader does not mean you have to bully them. If your not sure how to step up and be your horses leader then let me help you with that. I offer lessons in person or you can take my online courses. Yes they are beautiful creatures. They take my breath away everyday with their beauty. I appreciate you stopping by to leave a comment. Thank you for your article. I don’t care for horses, but my daughter loves them. Do you mind if I run off this article to give to her. We have had many animals and I think they all have a pecking order. Makes sense. People also find way of having a pecking order too. Thanks for the article. I don’t mind at all if you share this with your daughter. I agree all animals do have a pecking order. They are very interesting to watch. Thanks for stopping by to leave a comment.